Physical vs. Chemical: What’s really going on? Chemical sunscreens create a chemical reaction to dissipate the UV-rays into heat. Octylcrylen, Avobenzone and oxybenzone are key in ingredients in most chemical sunscreens. Oxybenzone is known for it’s possible ability to add to coral reef bleaching. Physical sunscreens use natural agents like zinc and titanium oxide for broad-spectrum sun protection by creating a physical barrier on your skin. Chemical sunscreens enter the skin, are nullified, then released as infrared rays (heat) into the skin. Physical Sunscreens like Pukoa Organics act much like sun reflectors for your car, and they do just that; they reflect rays off your skin topically rather than internally. Chemical sunscreens are more abundant and easier to find in your local convenience store. At times, they can offer more coverage against UVA and UVB rays. On the other hand, many of the chemicals used in these sunscreens can be harmful to your body and to the environment which as been researched by various institutions including the US National Library of Medicine. 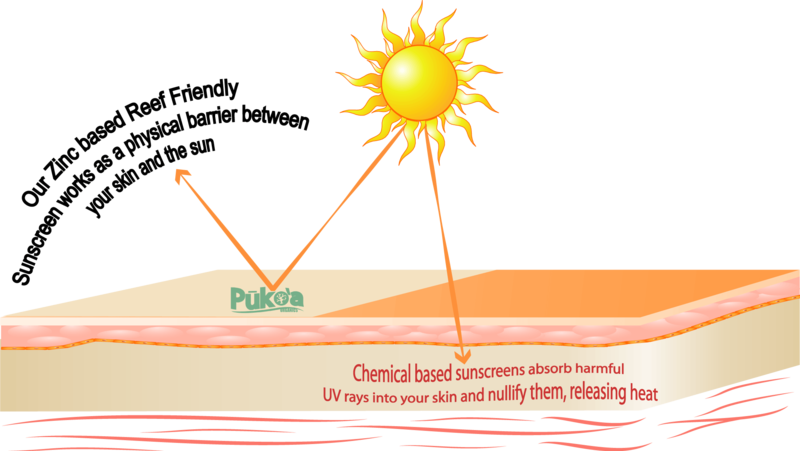 Pukoa’s Reef Safe Sunscreen Formula aims to protect everyone from the sun in an environmentally-friendly fashion. In addition, we hope to give everyone access to a natural sunscreen with competitive pricing.